In the dimly lit streets of Vancouver, BC, I could see the jacket of the rider ahead of me light up every time a car passed from behind. I admired the looks of the jacket as we had ridden from restaurant to pub to pub. As we neared the end of the six hour urban bike tour of Vancouver – which is a great way to see that city – I rode up next to the rider and asked “What kind of jacket is that?”. He replied, “It’s the Portland jacket by Showers Pass.” That was 2009, and the Portland jacket had been on the market for about a year. We live in a time where it’s considered normal for a clothing company to introduce a product and put to pasture in less than 24 months. Showers Pass has kept the Portland jacket basically unchanged for five years. Today, it’s refreshing to see a company stick with a model for a longer time. It gives the consumer a sense that they’re buying something that won’t be out of style or have antiquated fabrics in two years. These qualities hold true for the Portland jacket. It’s looks and functionality are high level in the world of commuter bicycle clothing. 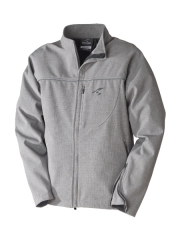 The jacket has a waterproof exterior and a polyester lined interior that helps absorb and transport moisture. 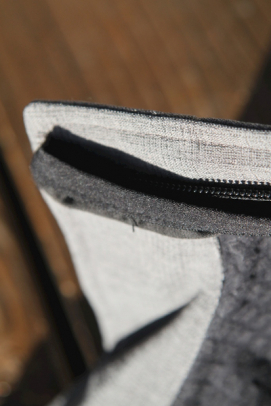 The lining also gives the jacket some extra loft and insulation. E-bike riders will really appreciate that because the combination of traveling at 20mph with less effort means wind chill is more of a factor. Staying dry and warm makes riding an e-bike that much more enjoyable. 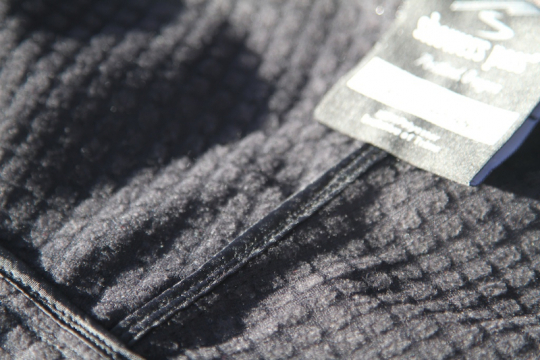 Close up view of the interior lining of the Portland jacket. 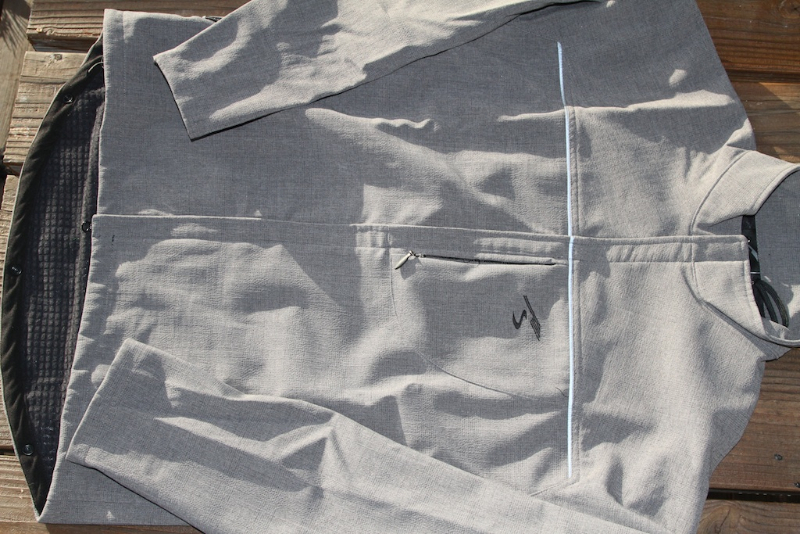 The square pattern helps trap air which in turn makes for a thinner yet warmer jacket. The lining also helps keep whatever you’re wearing under the jacket dry – always a challenge with completely waterproof garments. Showers Pass paid attention to detail and this jacket has features that are usually found on pieces costing quite a bit more. This image shows the zipper housing at the collar which ensures a soft feel all the way around the neck. Inside the chest phone pocket is this port for an audio/mic cable. Not everyone listens to music, books or podcasts while riding but sometimes it’s nice to be able to field a hands free call through a microphone, pull over and have a chat. This is the bottom of the back of the jacket. 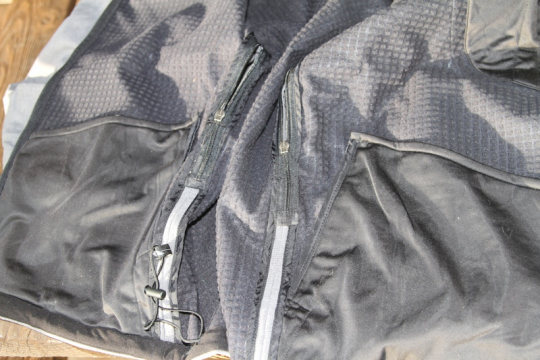 The reflective panel is unsnapped and opened, making the back of the jacket longer for bent-over riding positions, tire spray protection, and increased safety. When not in use, it’s easy to fold the flap inside and re-snap, creating a more traditional casual looking every-day jacket. 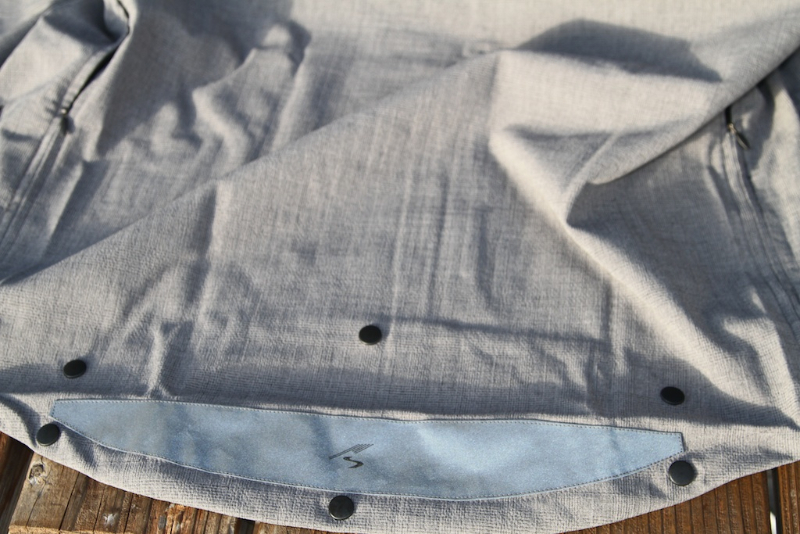 Detail of the inside of the jacket. 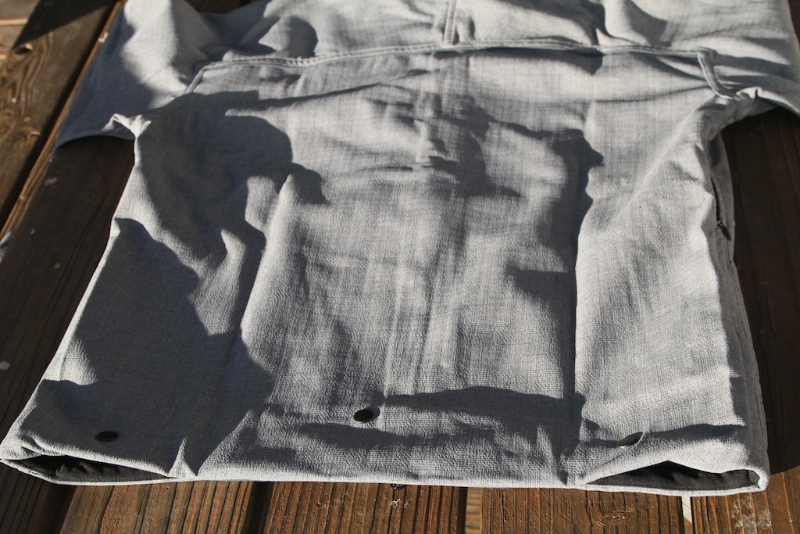 The smooth, black fabric is the large inside pockets. I really like having inside pockets on the front of jackets and they work really well for riding. Their size makes storing larger items possible and keeps them secure. 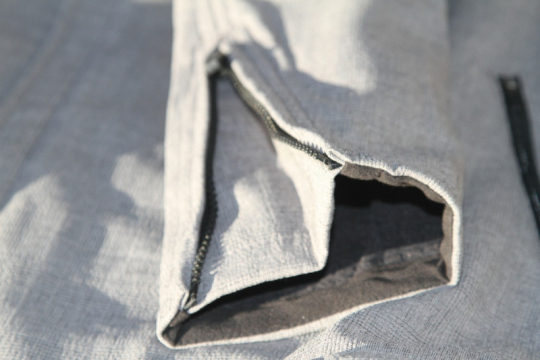 The vertical zippers are the left and right ventilation slits. I found the feature to work as advertised and helped circulate air around my back, which is where most waterproof jackets get clammy under exertion. 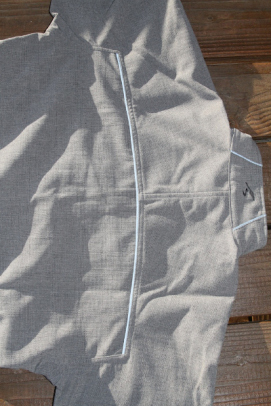 The cord near the left pocket is a cinch-cord to remove any excess slack. I didn’t find myself using that feature. Front of the jacket with rear flap down, showing the length extension. The reflective strip across the chest picked up the camera flash. Reflective striping across the top of the back and two small strips up the back of the neck. These are stylistic as much as safety features. The larger fold-down back flap offers much more visibility than the pin striping. Front view showing what the jacket looks like with rear flap tucked away and snapped. Rear of jacket, flap tucked away and snapped. The three plastic snaps are still visible from the exterior, but they didn’t bother me. Having them exposed breaks up the look somewhat and adds to the classic, “studious industrial” look. Wrist cuffs have these zippers on the underside of the wrist. I found these to be very useful for creating an air-tight fit over the cuffs of my gloves. When it was warm enough to ride without gloves, the zippers help create a cleaner, more aerodynamic profile and keep sleeves from rattling in the wind. I found the arm length and overall proportional fit on the Portland jacket to be nearly perfect – one of the best I’ve ever tested. In the weeks after receiving the test jacket, the weather in Central Oregon turned crisp and snowy. I rode over 100 miles in the jacket while doing daily errands to the grocery store, post office, gym, and various offices. I stopped at coffee shops and cafes on my routes every day. It seemed like I got more stares and long looks than usual, and I don’t think it was because my hair and skin were looking better. I can only chalk it up to the look of the Portland jacket. For my town, it’s looks are upscale compared to what people are normally commuting in by bicycle. The jacket is one of the warmest cycling jackets I’ve used. I initially thought that was going to equate to a jacket I would bake in. You don’t ever want to get too wet or sweaty in a cycling jacket – especially an urban riding jacket. 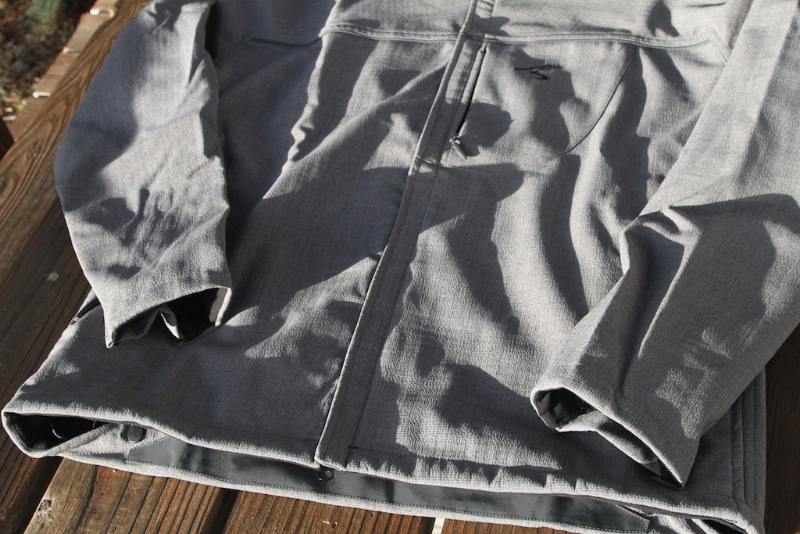 I did not get overly hot in the jacket while pedaling a conventional bike, and on an e-bike I really appreciated the slight bit of loft in the lining and the more robust shell fabric. On top of keeping me dry, warm, and looking somewhat dapper for a commuter, the substance of the jacket gave me the sense that it could protect me well in the event of a fall. This would not be a jacket I would suit up in cycling clothes and go ride 100 miles through the mountains on a non electric assist bike. It wasn’t designed for that, however it is certainly capable in the nastiest weather. I would however choose it to do a ride like that on an e-bike. 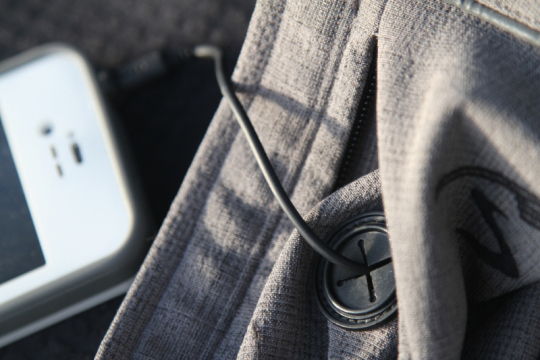 E-bike riders can benefit from clothing that gives greater protection from the elements while allowing cross-over use between active and casual wear. Wearing one piece that covers both sides of that equation helps keep things simple, which in turn provides more enjoyment. E-bike riders have much to gain from owning the Portland jacket. It’s a jacket that you will find useful for more than just riding – but will add much comfort, safety and enjoyment to your e-bike lifestyle. The jacket deserves to be named after a city known for it’s wet weather, friendly outlook toward urban cycling and strong e-bike community. Showers Pass included a women’s model, which is always nice to see. There is no reason for a woman to wear a men’s jacket if they don’t need to – and while I didn’t test that model, if Showers Pass payed as much attention to detail on the cut as they did to the men’s model, it’s safe to say it’s a winner. I wear the Mountain Equipment Co-op Derecho in the cool season and the MEC SuperMicroft cycling jacket in the warm season. http://www.mec.ca For $195 and $75 you are pretty well covered for whatever weather comes along here in Vancouver, BC.